ABS: There have been a number of producers that have showed up recently to unload cattle at Atlantic Beef Products Inc. (ABPI) with animals with no CCIA tags (RFID or yellow button tags) or having them in their hands. This is against the Canadian Livestock Regulations and can result in non-compliance for ABPI with the Canadian Food Inspection Agency (CFIA). 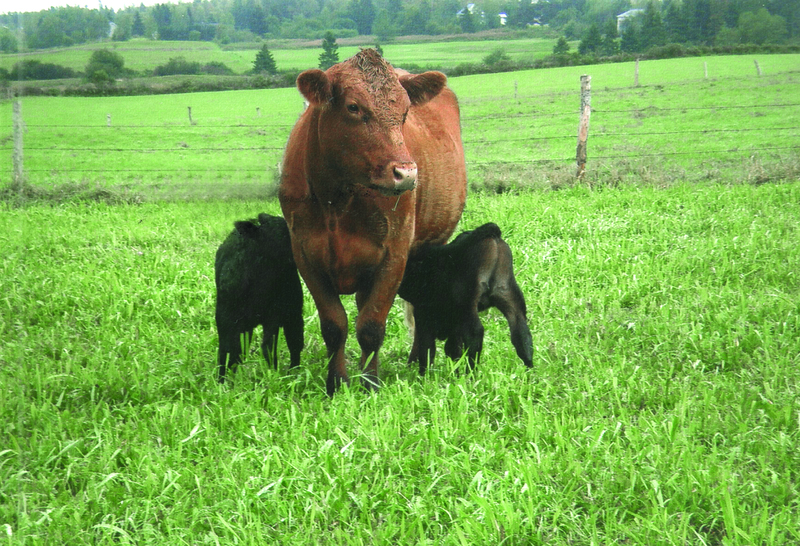 As a beef producer from New Brunswick, the levy increase issue has been front and centre for sometime. The N.B. Cattle Producer’s (NBCP) column in Atlantic Beef and Sheep’s spring issue stated: “Legal issues resolved ... clearing the way for a levy increase from $3 to $6 per head.” But have they? ABS: The “Rib Ends” section of the fall 2017 edition of Atlantic Beef & Sheep contained a condensed interpretation of an article that originally appeared in Alberta Farmer Express. Some readers may have been led to believe that viruses and bacteria are the same. I had a lot of respect for Dwayne Black. The first time I met him was at an exhibition. He had just dropped down from the rafters of a cattle barn howling like a coyote. Known as a prankster and for his sense of humour, he’ll be better remembered for the passion for, and love and care that he showed to everyone he came in contact with — people and cattle alike. Thank you all for the story about us, “Riding High” in Atlantic Beef & Sheep, Spring 2016. We were rather flattered about how much space you gave us as we were just expecting a short article. ABS: I recently read the article titled “Elite Beef Expo puts best face forward: scaled down showcase shines at the Nova Scotia Provincial Ex” in the Fall edition of ABS. The article discussed how a long-going traditional exhibition has been scaled down to benefit financially. There used to be 100-200 head of cattle at the Nova Scotia Exhibition for the duration of the annual summer show in Truro. This year, the show was capped at 100, with only a total of 89 animals exhibited in Angus, Hereford, Limousin, and Simmental. Exhibitions across Nova Scotia, and more so across Canada, have the purpose of displaying agriculture to those with an eagerness to learn more about the industry. They also give farmers a chance to gather and socialize with others. ABS: Congratulations, DvL, on picking an excellent editor and congrats to a very talented neighbor of mine. ABS: Well, I just finished reading the Winter edition of Atlantic Beef and Sheep cover-to-cover. What a great magazine full of usable information, especially the sheep information, and it’s great to be recognized in a beef magazine as a complementary sheep industry; well, a thriving sheep industry. Please keep up the great publishing work. ABS: Hats off to Patrick Holland of Montague. P.E.I., current Maritime Director to the Canadian Junior Angus Association board. In the last issue of Atlantic Beef & Sheep we read of his accomplishments in the World Angus Youth Challenge in New Zealand. Well, guess what, at a recent national Angus Youth Conference, GOAL, in Calgary he earned the Canadian Angus Foundation (CAF) Legacy Scholarship of $5,000. This scholarship is provided from the CAF Scholarship program established in 2013. Patrick was one of five finalists selected on academics and the application process. Then there was an interview by Canadian Angus Association members and a moderated panel discussion on industry and Association topics. Patrick topped all hurdles and came home with that award. Congratulations Patrick. You make all Maritimers proud with your accomplishments! ABS: My husband, 80 years young, cut down his herd. He culled four cows and lost one. Our cow count was always 40. Now, with five gone, there would be five less calves to worry about; one-eighth retired! We planned to have less cattle to look after this winter. Maybe with less cattle my husband would get in a little earlier for dinner or supper. There would be fewer babies to get sick and need attending in the night. We changed our calving season from December and January to September and October so there would be no more cold winter night births. It is a start on our retirement! The “babies” started coming in September, right on schedule. Gonna be a good winter! So far we’ve had six sets of twins. Newport Corner, Hants County, N.S.